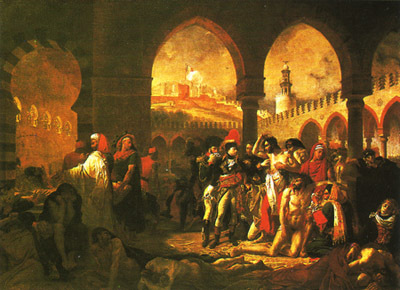 Following the British expansion in India during the first half of the 18th century, Napoleon's Egyptian Campaign in 1798, and the French conquest of Algeria in 1830, an idle curiosity about these distant lands grew into a specific interest that influenced European taste in general. An element of the exotic permeated trends in literature, music, and the visual arts throughout the 19th century. 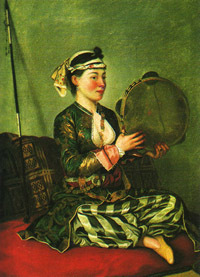 In the early 18th century, the influence of the Orient in art was of a purely decorative nature. Viewed through Western eyes, the Orient evoked by Western artists was a fanciful and distinctly Europeanized place, exemplified by the works of Giovanni Battista Tiepolo, Francois Boucher, Nicolas Lancret, and Charles-Joseph Natoire. 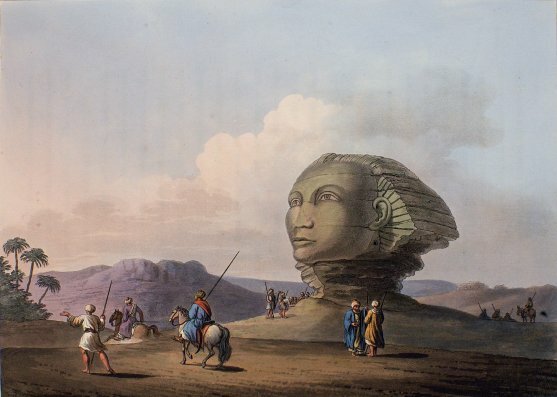 The increasing interest in the East was echoed in the realm of music, for example in the compositions of Rameau and Mozart, particularly Rameau's Les Indes gakmtes (1735), and Mozart's Die Entfuhrung aus dem Serail (1782). By 1770. the vogue for chinoiserie - the imitation of Chinese style, primarily in decoration and furniture - that had been popular in the Rococo period was beginning to fade. However, there remained a number of notable enthusiasts of the Chinese style, not least in the field of architecture. 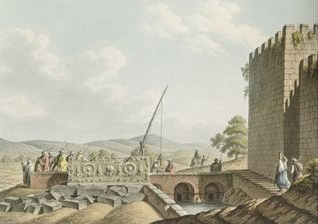 In 1799. for example, Venanzio Marvuglia (1729-I8l4) created a "Chinese Palace" at Villa La Favorita in Sicily as a refuge for King Ferdinand IV. 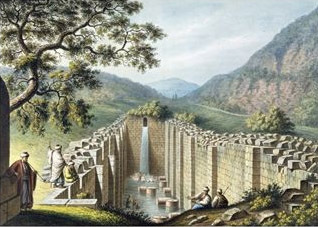 Soon after, at the beginning of the 19th century. 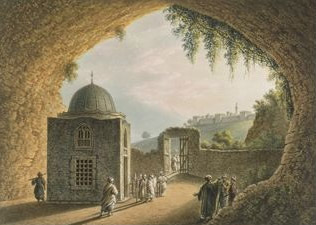 Oriental style was extravagantly revived by John Nash (1752-1835) in his reconstruction of the Royal Pavilion in the English seaside resort of Brighton. Although Orientalism did not become a well-defined style until the 19th century, its roots can be traced to a general love of exotica in the 18th century. Artistic treatment of Eastern subjects took the form of charming, picturesque recordings of artists' travels through Eastern countries, with scenes clearly refined to suit the tastes of a European audience. Of particular note is the work of the Swiss pastel painter and engraver Jean-Etienne Liotard (1702-89). who painted women dressed in Turkish costume, paving careful attention to detail and displaying an unprecedented degree of sensitivity to the subject. 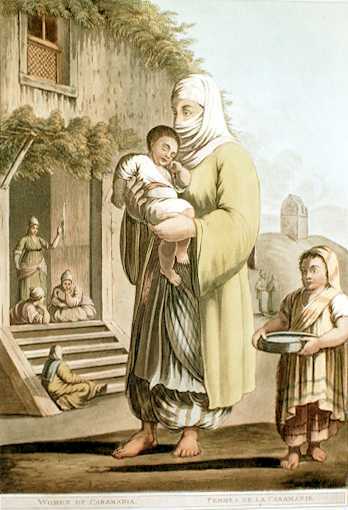 After spending four years in Constantinople from 1738, Liotard even chose to retain the Turkish dress and beard that he had adopted while abroad. 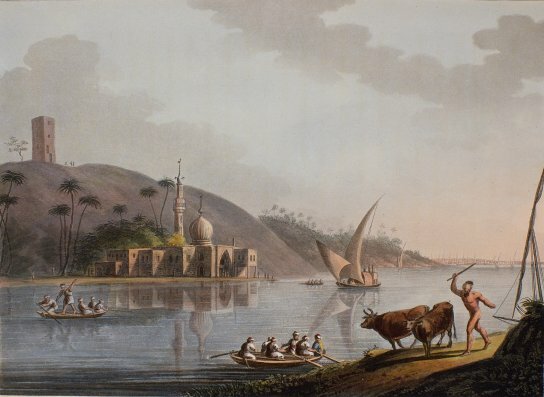 Another 18th-century artist to venture east was Luigi Mayer (c. 1755-1803), who travelled through the Ottoman Empire between 1776 and 1794, sketching and painting panoramic landscapes, ancient monuments, and the Nile and its surroundings. During the late 18th century, the East was not only a rich source of inspiration for decorative themes and motifs, but also yielded great scientific discoveries. In order to meet the need to give a sound methodological basis to these new studies, in 1793 a special school was set up in the Bibliotheque Nationale in Paris for the teaching of Arabic. Turkish, and Persian. Egyptology, followed later by Assyriology. soon became the fashionable hobby of the educated classes. 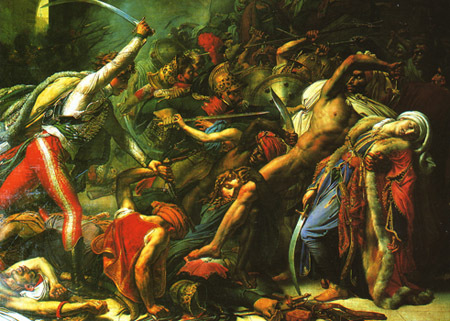 Much admired were the works by Baron Antoine-Jean Gros (1771-1835) and Anne-Louis Girodet-Trioson (1767-1824), that documented Napoleon's Egyptian campaign; these were elevated to the rank of "great" paintings and accorded the status of official art. For the first time, the East was explored, reorganized, reassembled, and finally reborn in the monumental Description de I'Egypte. 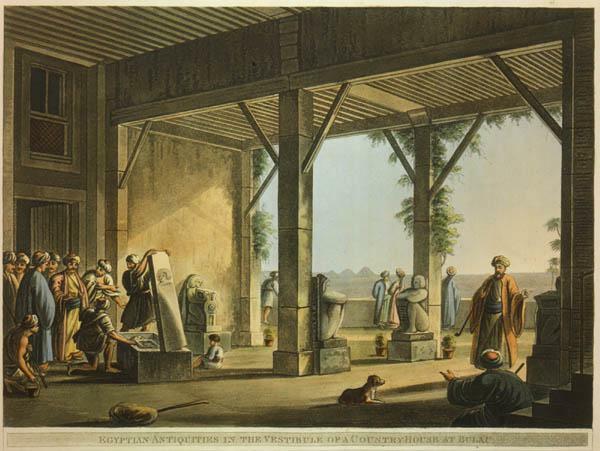 This study was published in 24 volumes (1809-28) by the Institut d'Egypte, founded by Napoleon for the purpose of studying Egyptian civilization. In Rome, at the Palazzo Braschi, an Egyptian Room was established to display all the gifts brought by Napoleon to Pope Pius VI. His successor, Pius VII, acquired the collection of Andrea Gaddi, and along with statues from Thebes and other Egyptian articles, housed them at the Vatican. 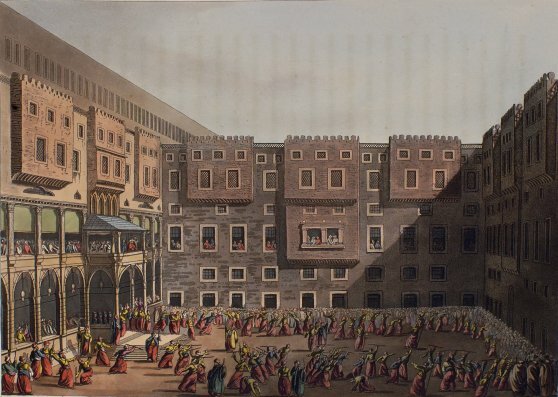 Here, in 1836, Gregory XVI opened the Egyptian Museum, its walls painted like those of the palaces on the banks of the Nile, and its ceilings adorned with golden stars sparkling against a cobalt-blue sky. 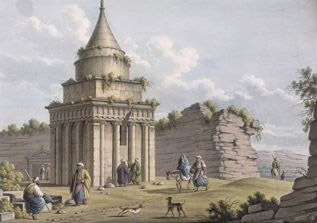 The Temple of Hermopolis, "Champollion"
Following Napoleon's campaign of 1798, the Egyptian style became fashionable throughout Europe. It was favoured for the furnishings of grand town houses and was also adapted to less ostentations dwellings. 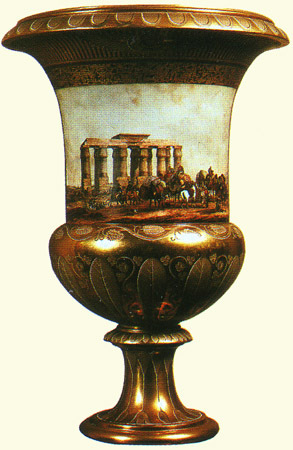 Decorated furniture, fabrics, goldwork, jewellery, and porcelain all featured such details as sphinxes and caryatids. The French ceramics manufacturer Sevres produced dinner services with sumptuous designs of hawks, sphinxes, and hieroglyphs. 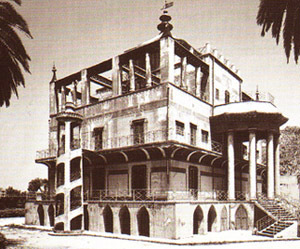 Many villas and palaces displayed the popular taste for the Egyptian style: Napoleon's residence at Elba, the Villa di San Martino. 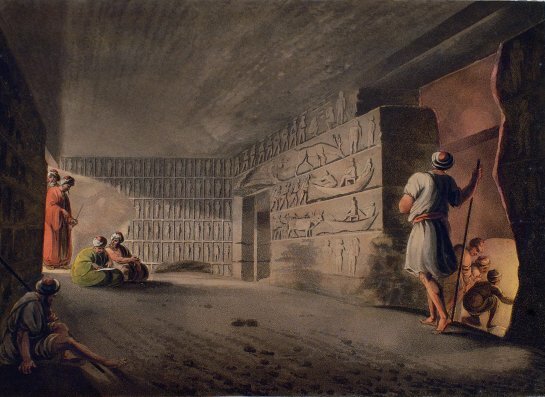 where he was exiled between 1814 and 1815, was a triumph of the interior decorator's art, complete with Egyptian room and gardens embellished with pillars and obelisks. Tombs shaped like small pyramids and obelisks begin to till cemeteries, such as Montparnasse and Pere Lachaise in Paris and Kensal Green in London. These were derided by the English architect and propagandist of the Gothic Revival Augustus Welby Northmore Pugin (1812-52) in his Apology for the Revival of Christian Architecture in England (1843). 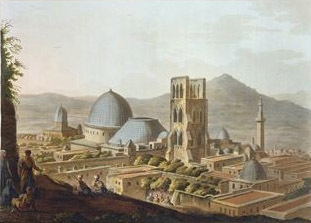 With the advent of the 19th century, grand monuments to conquests of exotic lands appeared increasingly in the public squares and avenues of Europe. To commemorate his Egyptian campaign. 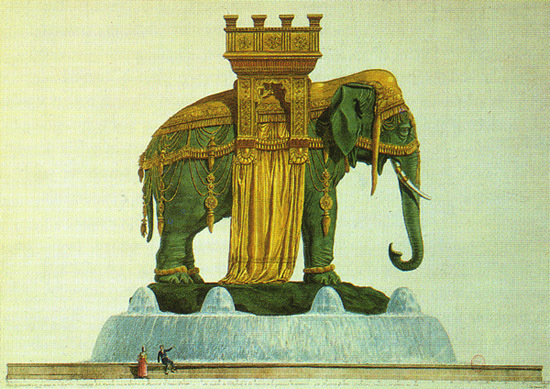 Napoleon ordered the erection of a fountain adorned with exotic decorations, and he gave Parisian streets Egyptian names, including me Damiette and rue du Caire. 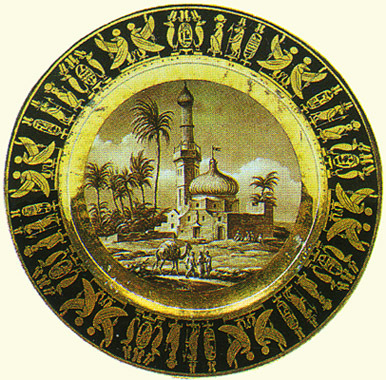 Subsequently, the fashion for Egyptian ornamentation was widely embraced — disseminated through D-V Denon's illustrated Voyage dans la Haute et dans la Basse Egypte (1802) and the Institut d'Egypte's magisterial Description de I'Egypte (1809-28) - and became particularly successful in the US. 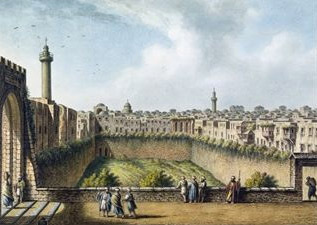 In England, to commemorate Nelson's victory in the Battle of the Nile in 1798, several Egyptian-style buildings and interiors were created. 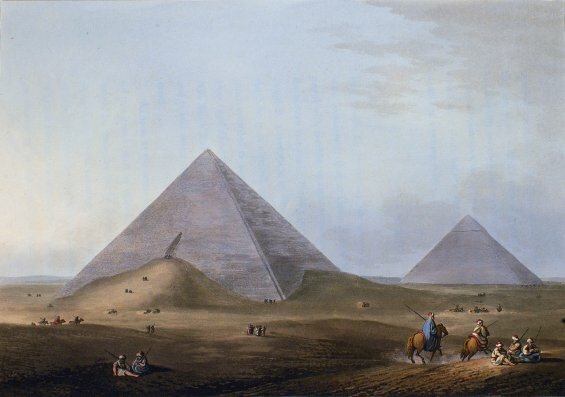 Egyptian features were freely mixed with other styles, such as Neo-Gothic and Neoclassical. Between l750 and 1753, Giovanni Battista Tiepolo painted a series of frescos at the residence of the Prince Archbishop of Wurzburg. These included personifications of the four continents on the ceiling of the staircase in the Kaisersaal. Painted with triumphant, whimsical verve, the theme was widely imitated in simpler forms in private houses. 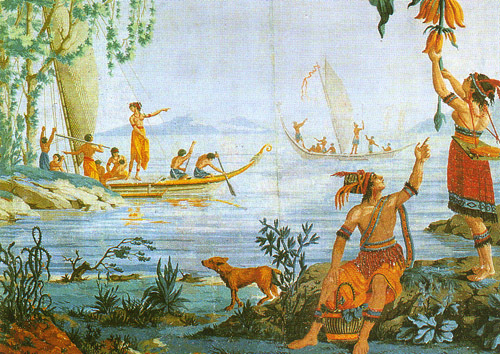 Exotic countries and voyages to faraway lands provided the subject matter for spectacular papiers panora-miques— brilliantly coloured wallpapers that adorned drawing and dining room walls. The sources of such images of distant imaginary worlds were often found in literature, such as Jean-Jacques Rousseau's story, La Belle Sauvage, Montesquieu's Lettres persanes, and the writings of Voltaire, Diderot, and Bougainville. Rococo asymmetry lent itself to the incorporation of chinoiserie, which readied the height of its popularity in the 18th century. European craftsmen drew freely on the decorative motifs found on goods imported from China. The first major application of the Chinese style for an interior design was in Louis Le Vans Trianon de porcelaine at Versailles. built in 1670 and later destroyed. The style was adopted in court residences across Europe. Schonbrunn Palace (1695-1711), the summer residence of the Habsburgs just outside Vienna, had a Chinese room, as well as gardens - laid out in about 1705 by Jean-Nicolas Jadot de Ville-Issey - that included pagodas and tea houses. The second quarter of the 18th century saw a revolution in garden design, as irregular Chinese models replaced formal designs. In England, the Chinese example was combined with a romantic eclecticism to produce the Anglo-Chinese garden. In 1757, the English architect Sir William Chambers published his Designs of Chinese Buildings... and, in 1772, his Dissertation on Oriental Gardening, condemned by Horace Walpole as disgraceful. 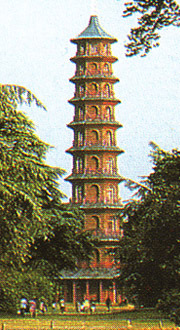 Despite its detractors, the Chinese theme was taken up in garden and palace design throughout Europe. Most memorable are the pavilion at Sans Souci in Potsdam (1754—57) and Catherine the Great's Chinese palace at Oranienbaum in Germany (1762—68); the Chinese palace in the grounds of Villa La Favorita in Sicily; the Chinese pavilions in the gardens at Cibalka in Prague (1818-24); and at the Wilanov Palace in Poland (c.1805). During the 19th century, chinoiserie was superseded by other exotic-tastes, such as Turkish, Egyptian, Gothic, and Greek.